You are here: Home / Events / All Aboard the HooDoo Choo Choo! Craft beer, fine food by Lavelle’s Bistro, and beautiful scenery, Oct. 18. 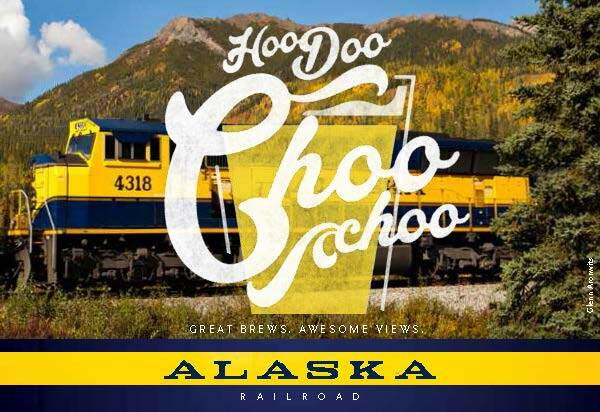 For the first time, we’ve partnered with the Alaska Railroad and Lavelle’s Bistro to offer beer enthusiasts an evening of Oktoberfest-style fun aboard the HooDoo Choo Choo beer train. The train will depart at 4 p.m. Oct. 18 for an evening of brew sampling aboard a round trip rail journey to Nenana. The HooDoo Choo Choo offers passengers the atmosphere of a beer festival in a truly unique setting: traveling through Interior Alaska aboard the Alaska Railroad. The experience is completed with HooDoo Brewing Co. specialty brews, hors d’oeuvres from Lavelle’s Bistro and a fun crowd of beer connoisseurs. The HooDoo Choo Choo departs from the Fairbanks Depot at 4 p.m. and returns at 8:30 p.m. Tickets are $169 per person and include round-trip travel to Nenana, light fare and six half-pint beer samples. Additional brews will be available for purchase. You must be 21 or over to purchase a ticket. For more information visit www.alaskarailroad.com or call Alaska Railroad reservations at 1-800-544-0552.